A fat juicy raspberry, preferably straight from the bush and still warm from the sun, is one of the delights of the British summer. We have lots of raspberry recipes for you, starting with our favourite raspberry jam recipe. Put a saucer in the freezer before you start. Place the raspberries in a large pan and allow to simmer very gently until soft – about 15 minutes. Remove from the heat and gradually add the sugar, stirring well, until dissolved. Return to the heat and bring to the boil. Now you need to let it boil hard. Bubbles should be appearing furiously! After about 5 minutes, start checking to see if it’s reached setting point. It could take much longer depending on the quality of the fruit. When the jam is ready, pour it into sterilised jam jars and allow to cool. When cool, cover and store in a dark cupboard. Using a teaspoon, take some jam from the pan and put it on the ready-chilled saucer. Push it with your finger. If it wrinkles, setting point has been reached. If it’s still runny, return to the boil for a few minutes before testing again. Place upside-down in the oven pre-heated to 140oc, gas mark 1, for at least 30 minutes. Grease a dish and pre-heat the oven to 180oC, gas mark 4. Sieve the flour into a mixing bowl and add the fat, cut into small cubes. Rub the fat into the flour using your fingertips. When you have a breadcrumb-like mixture, stir in the sugar. Core, peel and thinly slice the apples. Arrange half over the base of the dish, put the raspberries on top and sprinkle with the sugar. Cover with the remaining apples and top with the crumble mixture. Bake in the over for about 40- 45 minutes, or until golden and crisp. This gives a fairly solid crumble but if you’d like a crumblier crumble, increase the flour or add some porridge oats for texture. Put the sugar and water in a saucepan and stir, over a gentle heat, until the sugar is fully dissolved. Boil for 5 minutes or until you have a syrup. Allow to cool. Whiz the raspberries in a blender for a few seconds. Push through a sieve to remove the pips. Stir the sugar syrup and lemon juice into the raspberry puree. Pour into a dish and place in the freezer. When the mixture in the freezer has begun to firm up round the edges, remove from the freezer and stir well. Gently fold in the whipped egg white. Return the sorbet to the container and freeze until firm. A traditional Scottish dish that is best served in tall sundae glasses. Put the oatmeal in a thick-bottomed pan on a very low heat. Shake the saucepan occasionally so that the oatmeal browns but don’t let it burn. Set aside to cool. Whisk the cream until thick. Stir in the honey, whiskey, 2 oz raspberries and 1 oz oatmeal. Reserve 4 raspberries for decoration then share the rest between 4 sundae glasses. Divide the cream mixture between the glasses, and sprinkle with the remaining oatmeal. Decorate with a raspberry. 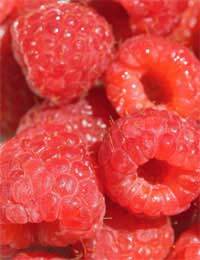 Place the raspberries in a saucepan and add 2 oz sugar. Heat very gently and stir slightly to break up the fruit a little and start the juices running. When the fruit is soft, press it through a sieve to get rid of the pips. Add the remaining sugar and the lemon juice to the fruit and stir well to mix. Refrigerate until ready to use. This is delicious served over strawberries – allow them to mingle a little before serving. Use with ice cream or fresh peaches. To make raspberry leaf tea, soak 1 oz dried raspberry leaves in 1 pint boiling water for about 10 minutes. Strain. To dry leaves, spread them in a single layer on kitchen paper in the airing cupboard or other warm place, turning occasionally until dry. Gargling with raspberry leaf tea is a trusted folk remedy for sore throats and ulcers. It’s also highly recommended by many mothers as a uterus-strengthening aid in late pregnancy (but shouldn’t be taken during the first trimester). Add rosehip syrup, maple syrup or other flavouring to improve the taste – which isn’t enjoyed by everyone! Raspberry leaf tea can be bought ready-prepared from health food shops or via the internet.